this post is for nokia lumia 520 earpiece problem solution. if your phone’s earpiece also called speaker the one that is used for calling and not for ringtones and music is not working or you have damaged the earpiece connection points, you can use the diagram in this article to solve this problem. before doing any thing make sure that damaged earpiece is not causing this problem. 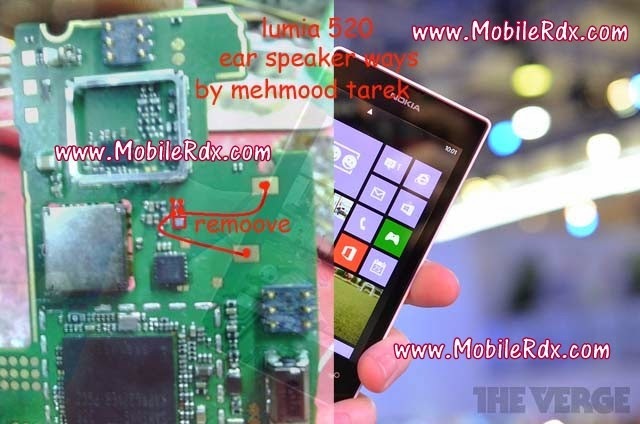 i have marked nokia 520 speaker ways in this diagram make the jumpers as shown in it. speaker’s point marked with red jumper. here are earpiece ways problem solutions. please observe carefully. note: every repairing solution posted on mobilerdx.com is tested by at least one member of our team. use the information available here at your own risk. we are not responsible if any harm comes to your device during the repairing process.